I had developed about 20 casual games in the space of 6 years, but none of these were a success, and the $90,000 that I had saved up over 17 years had almost run out. That’s when my luck began to change. I read an article about the <a href=”https://www.applovin.com/”>AppLovin</a> Apple TV <a href=”https://www.applovin.com/appchallenge”>App Challenge</a> on my Facebook timeline and decided to enter the contest thinking that a good result would help to promote my games. At that time, I was in two minds about whether or not to buy an Apple TV for the contest because I was honestly unsure about whether I could win. But my mind was made up when I managed to borrow one from a friend. This is the story of the development of Dungeon Tiles. Once I’d made up my mind to take part in the Apple TV App Challenge, I had about 7 weeks before the deadline. I’d never even touched an Apple TV, so I borrowed one from a friend and researched what kind of games had been released and which were popular. First, I needed to find some hints for making a game that could be played using the Siri Remote without experiencing stress. 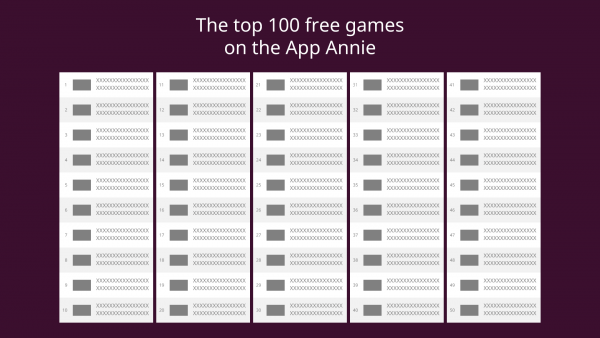 When I searched on App Annie, I discovered that there were a lot of action games but few puzzle games. So I decided to make a sliding puzzle game that would be easy to control using the Siri Remote. During the next three days, I had a few ideas for puzzle games using animals and other cute objects as motifs. However, none of the plans seemed enjoyable. I knew that I didn’t have much time to spend on planning due to the deadline, so I decided to revisit a game that I had previously planned then scrapped. This was a plan that I had thought of during the development of my previous release, Sword & Dragon. I had made the decision not to develop the game because the rules were too complicated. I decided to go with this game because I could turn it into a good game if I simplified the rules. At that time, the game contained many RPG elements: swords, dragons, life, gold, potion, forts, etc. I selected 4 of these: swords, dragons, life, and gold. When I asked my friends about my plan, many of them told me that it sounded interesting, so I decided to go ahead with it. To develop the game in time for the deadline, I needed to economize on time by adopting a minimalistic design. I also thought that a simple, intelligible design would attract female players, who are not typically big on RPG-type games. During the development of Sword & Dragon, I had trouble because the background color was bright, meaning that the effects did not stand out. So this time I decided to give the game a dark background color. I wanted to create a minimal, dark fantasy feel. Since I wanted to use a dark color for the background, I decided to choose from the following four colors. Black and dark blue were not typical RPG colors and I felt that cave was overused in RPGs. 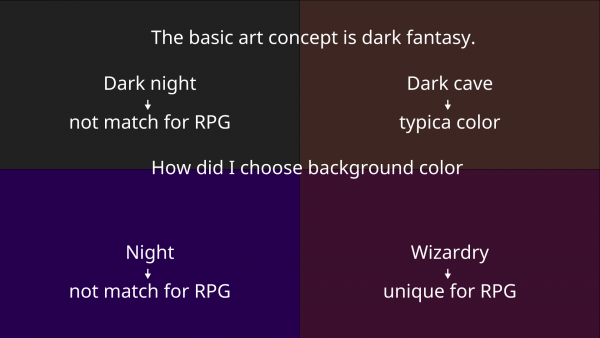 Dark purple was quite rare in RPGs, but when I asked a young girl for her opinion on this color she reacted well, so I decided to use it hoping that it would be well-received among female players. 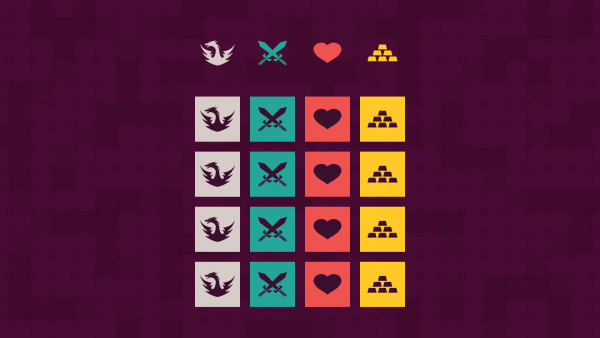 I decided to make the four tile types based on the tile designs used in Sword & Dragon. 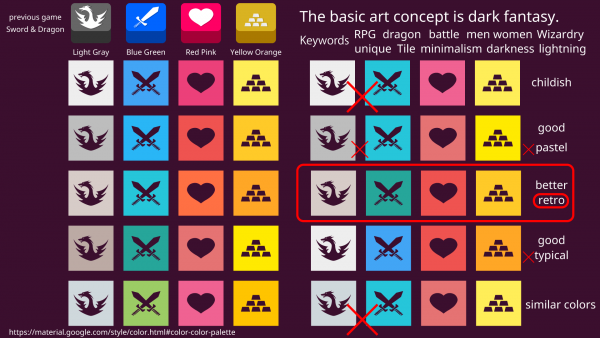 For Sword & Dragon, the dragon tiles were black, sword tiles were blue, life tiles were red, and gold tiles were yellow. For Dungeon Tiles, I realized that black would not stand out on the purple background, so I decided to use light gray for the dragon tile. I wanted all of the colors to have the same tone, so I referred to a color palette when choosing them. I had the following keywords in mind: RPG, dragon, battle, for men and women, wizardry, unique, tile, minimalism, darkness, and lightning. 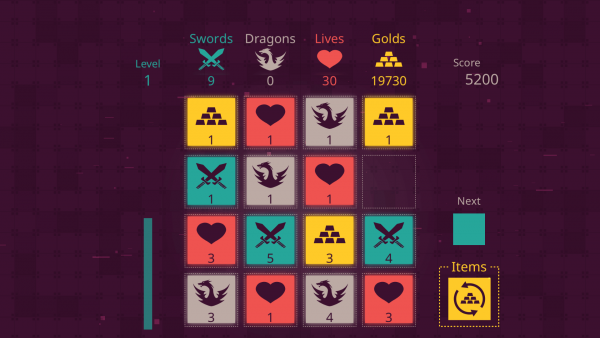 When playing the game, having four tiles with similar colors would make it confusing and unclear, so I needed to choose color combinations that players could instantly tell apart. To further improve the design, I used the same brightness and saturation and differentiated the colors based on hue. When I viewed the colors in combination, I discovered that gray and blue were similar and potentially confusing, so I mixed a small amount of brown in with the gray and green in with the blue. Since the name of the game was Dungeon Tiles, I used squares in the design wherever possible. 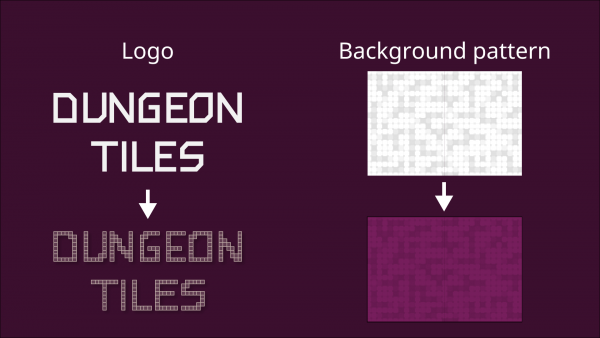 For the logo and background, I decided to use a maze-like pattern consisting of tiles. Then I completed the following prototype design. 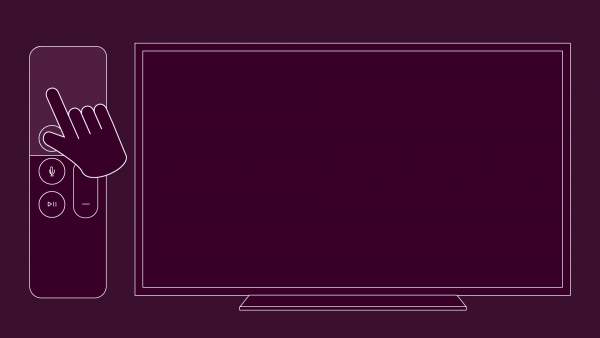 Games developed for Apple TV must run in landscape. However, it is easier to play with a portrait layout when using an iPhone, so I decided to give the player a choice between both layouts. I developed the game so that it could be played in either landscape or portrait. Next, predicting that Apple TVs would likely be used in people’s living rooms and other communal spaces, I included a two-player mode for friends and families to enjoy. Also, since most Apple TV users own only one Siri remote, I developed a turn-based system where players use the Siri Remote in turn so that all players could enjoy the two-player mode. Moreover, I added effects to produce an exhilarating feeling when tiles are combined. I decided to make the game compatible with the Siri Remote so that players could enjoy playing it on Apple TV. I had already included the minimal functions for the contest in the prototype, so I added the following functions in the following order during the time remaining before the deadline. I tried to make a game that could be enjoyed using simple controls. I made it suitable for long-time play by adding strategic elements. I included a two-player mode so that I could promote the game as an Apple TV application. I made a mechanism for obtaining gold by watching advertisements and using this gold in the game. Since the display sizes and control methods are different for the Apple TV version and the mobile version, I feel it is important to develop a game that accounts for these differences and can be played without experiencing stress.